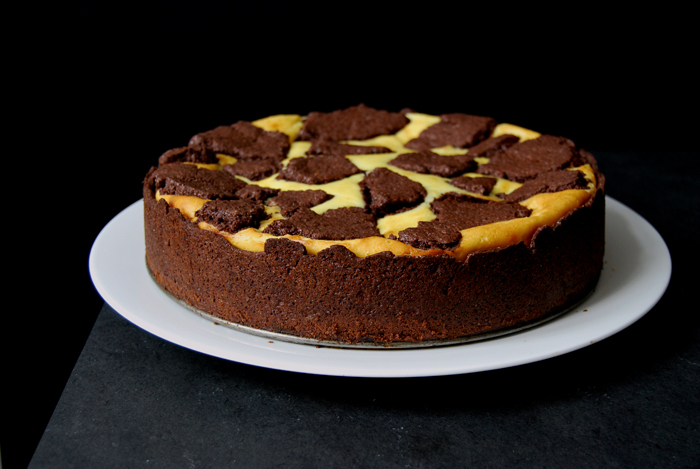 If you like the combination of bittersweet chocolate and creamy cheesecake, this is your recipe! Russischer Zupfkuchen is a German cake classic. Although its history is still relatively young and a little in the dark, this cake gained rising popularity over the past few decades. The name is slightly misleading, there is no proof of a connection to the Russian cuisine, this cake is a culinary mystery, a sweet one, and it might stay that way forever. 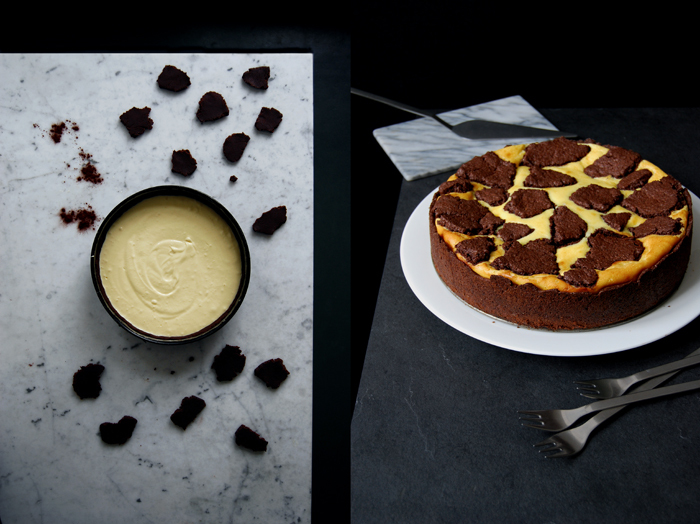 Zupfkuchen means plucked cake, which refers to the chocolate dough on top that’s also used for the base. 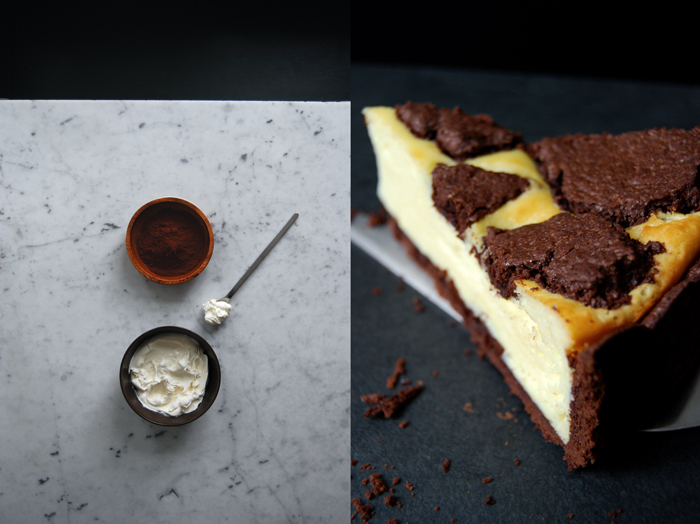 It’s a dark, crumbly short crust that brings some depth into this sweet and creamy treat. Traditionally, the topping is made with quark, the German dairy product which is similar to ricotta or cottage cheese, it creates a bit of a heavy, more dry texture. I tried many of these cakes in my life and this particular texture was often the reason why I couldn’t really warm to it, apart from the fact that many were simply too sweet for my taste. 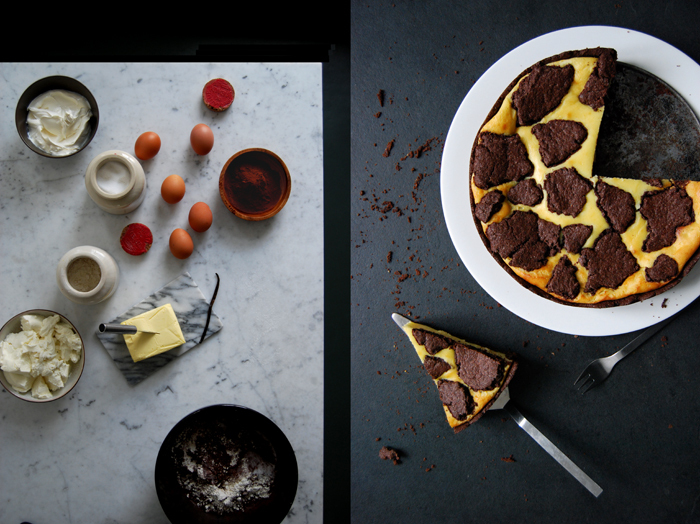 When I decided to create my own Zupfkuchen I wanted to work on these two points, texture and sweetness. I had something lighter in mind, a filling made with ricotta and a little bit of mascarpone, definitely less sugar and more eggs than you’d find in the usual recipes. The texture turned out to be a cross between a soufflé and a flan, it’s like a French take on this rather rustic cake. Especially when you try a piece while it’s still warm, it tastes a bit like custard, resembling the fine eggy note of a crème caramel which fades away as soon as the cake cools down. 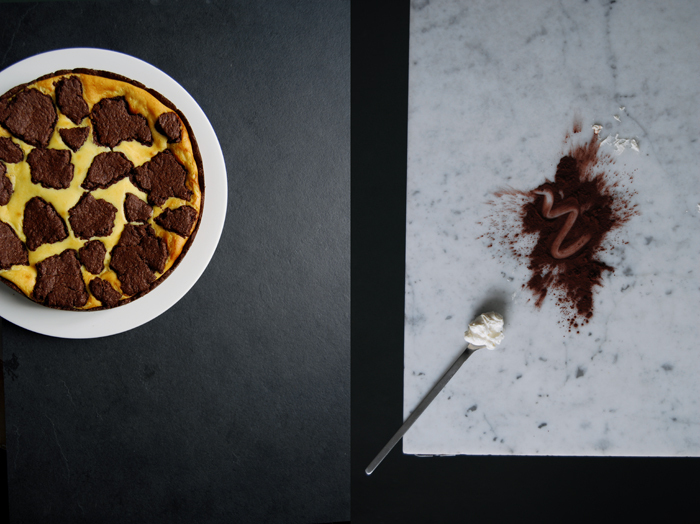 If you’re a Zupfkuchen traditionalist, you might be a bit disturbed by this new nuance, but if you savour with an open mind, you can enjoy the contrast of chocolaty darkness and light milkiness. Just add some more sugar if there are children at the table, this is a less-sweet-adult cake. Before I forget, we found the cake best on the second day! Combine the flour with the sugar, cocoa powder, baking powder and salt. Cut the butter into the flour with a knife until there are just little pieces of butter left. Continue with your fingers and rub the butter into the flour. Add the egg and milk and continue mixing with the hooks of your mixer until combined. Form a ball, wrap in cling film and put in the fridge while you prepare the cheese topping. In a large bowl, mix all the ingredients for the cheese topping with an electric mixer until well combined and creamy. Set the oven to 180°C / 355°F (top/ bottom heat) and butter the springform pan. Divide the short crust in 2/3 for the base and 1/3 for the chocolate topping. Roll out 2/3 of the dough between cling film, big enough to come up about 2/3 of the rim of the springform pan and line the pan with the pastry. Continue rolling out the remaining 1/3 of dough between cling film (about 1/2cm / 1/4″ thick) and pluck it into roundish pieces for the topping, set this dough aside. 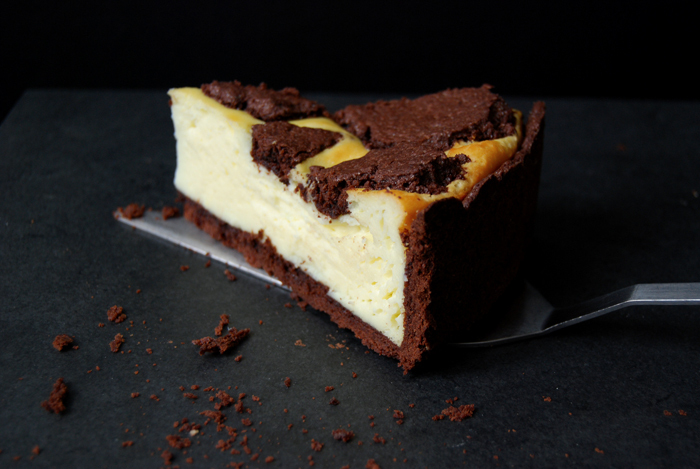 Pour the cheesecake topping in the pastry lined springform pan and bake for 20 minutes. 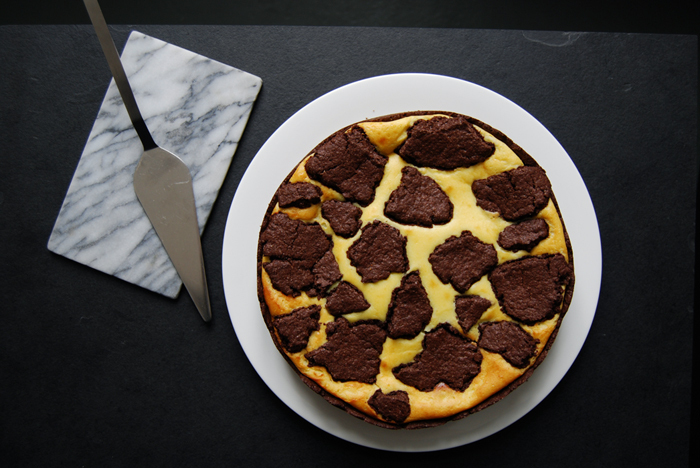 Open the oven and gently (and quickly) lay the plucked chocolate dough pieces on top of the cheese topping. Bake for another 35 minutes or until golden and firm on top. Switch off the oven, open the oven door and keep the cake in the oven for another 5-10 minutes. Take it out and let the cake cool before you take it out of the springform pan. This looks amazing! So rich and decadent with that chocolate crust. Perfect!